I don't think I fully realized how much I distanced myself from all my favorite work staples last year during my unemployment. All my usual pencil skirts and blazers that were previously on constant repeat sat dormant. 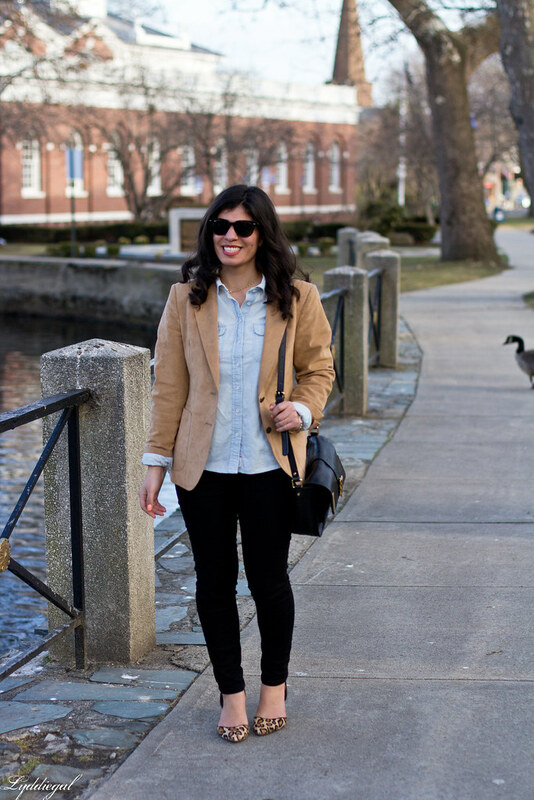 Since I'm linking this post up with Happiness at Mid-Life's Throw Back Thursday, I looked up the last time I wore this camel blazer, and it was November 2013! It seems like it was long over due for a wear, and hopefully many more in the near future. 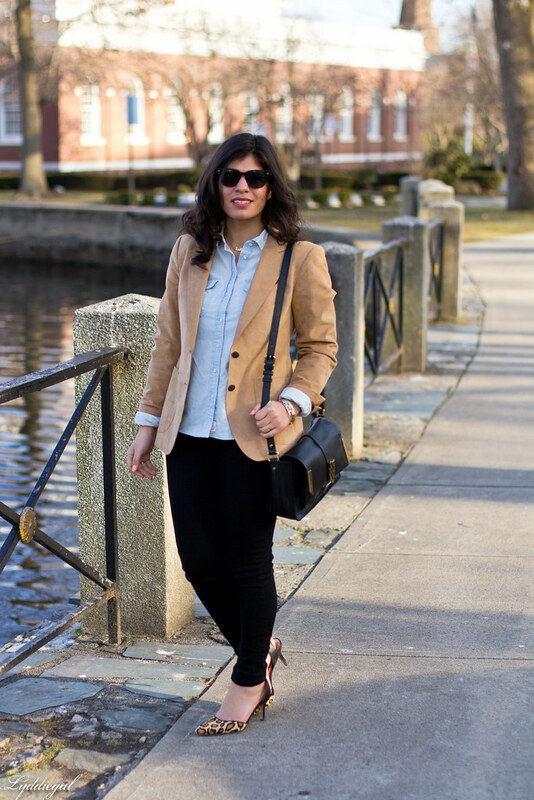 Everything you put together for this look is in perfect sync with each other esp the camel blazer & those leop pumps! This look is effortless & chic! You look amazing! Love the neutral combination and those heels are to die for! That's a long time between wears! Also, this really makes me realize that I need more camel in my closet....one camel-toned cardigan is simply not enough. Oh my word. Is that suede? It looks amazing. I love it with the shoes too. Simple and classic. Aw yes. I can pretty much wear what I want to at work, but I have a lot of casual pieces that get totally neglected . . . or did until I had a baby and changed from work to play clothes almost as soon as I walk through the door. 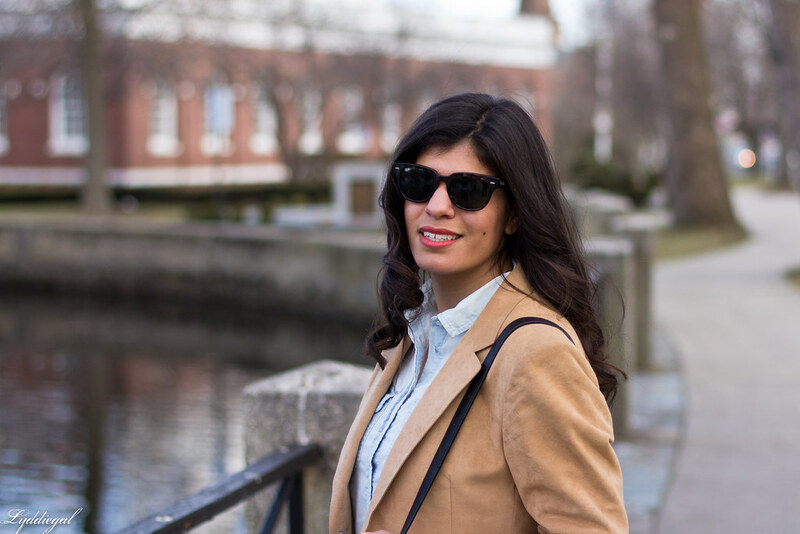 Love this blazer and the way that you've styled it here! Loving that blazer with your gorgeous leopard heels! Definitely the perfect combination. WOW, how was it overlooked for so long ? I totally remember this garment, its is a beautiful blazer. ..
Great work staples. And the leopard heels are so fun! Gorgeous look! So happy you brought some things back. I always put things to the side during unemployment or other events and forget about them! I love this blazer with the denim and the leopard heels! Loving this bag so much! I think I should invest in a tan blazer! This look is effortless! great jacket. what a find! Classic blazer and those shoes. . . Your blazer looks amazing with those shoes! I love these classic pieces together! That bag is gorgeous! I can't this beauty has been unworn for over a year. I am glad it's put to use again - a great classic blazer and so perfect with those leopard heels. I haven't worn my blazers in a while either now that I'm a SAHM, but this is inspiring me to pull them out too! 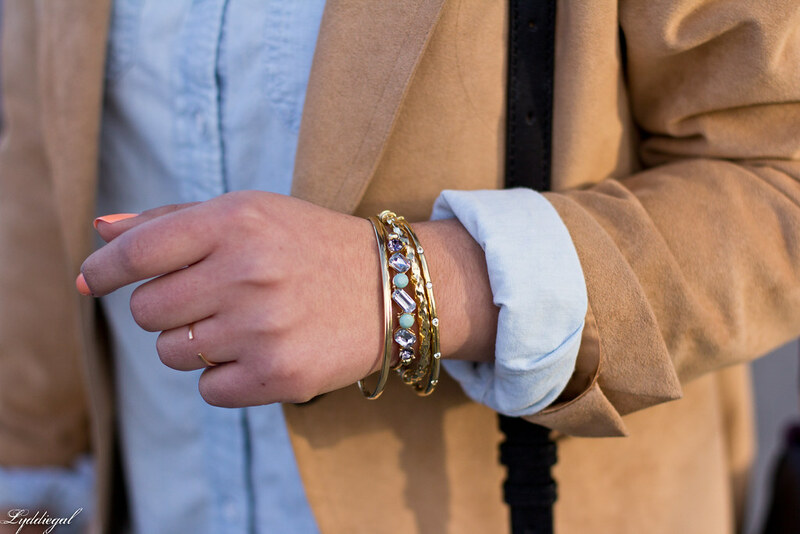 There's nothing better than a classic camel blazer! Loving it paired with leopard! You look so fabulous! 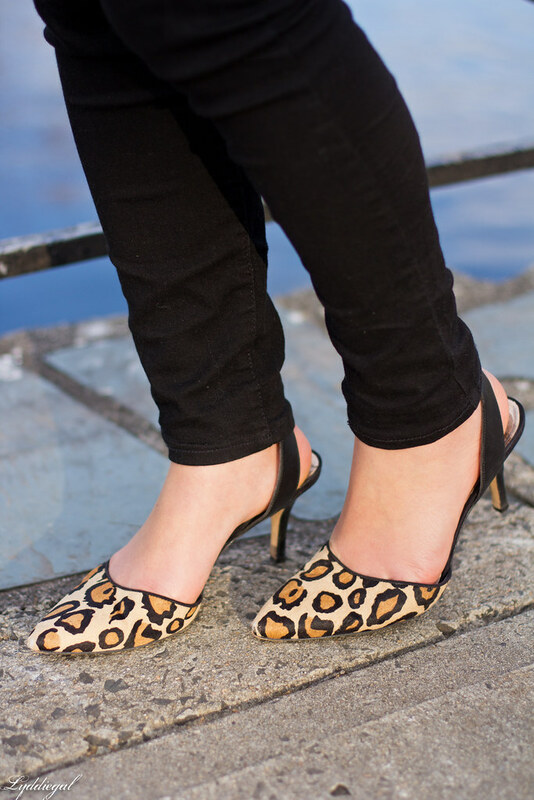 I particularly love the touch of leopard in your flats! 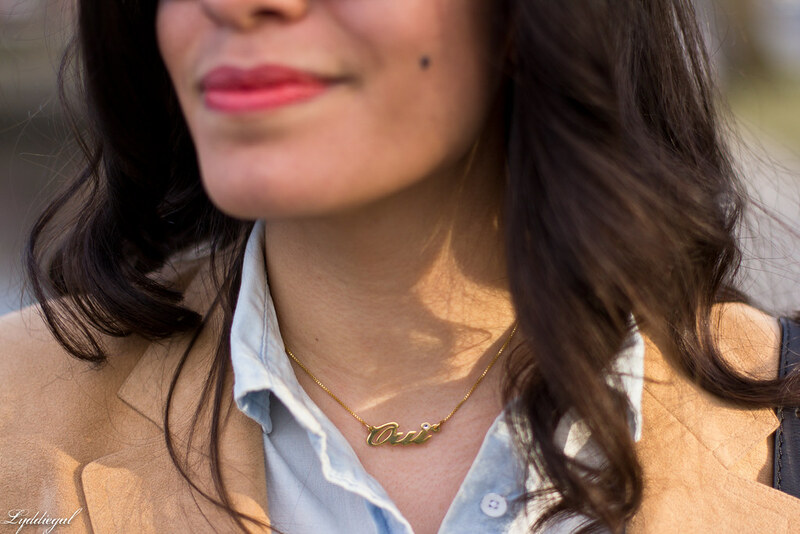 Such a cute and unexpected detail that really makes your whole look so fun! It takes a while to get used to not wearing work clothes... But once you do, it's surprising how far your style can really move away from them. After not working for fourteen months when we lived in Paris, I never truly got back into pencil skirts and blazers. And although I still wear them occasionally, I tend to think it's for the best. Office dress codes really do a great job, not so much of stifling creativity but of stopping us from thinking about what we're wearing because we just focus on playing by the rules. I think this is your best outfit with this blazer to date! 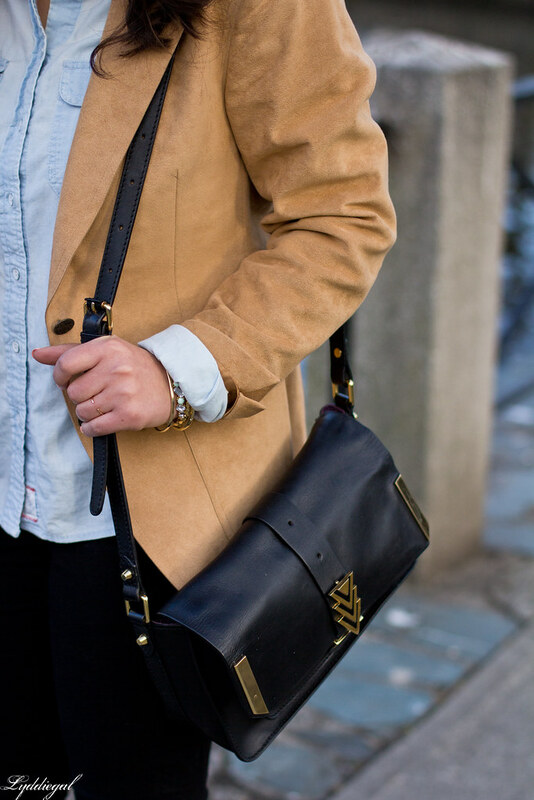 A camel blazer is such a classic piece, I love how you styled it here with my fave...chambray and those leopard shoes. Love those!! What a lovely work staple! 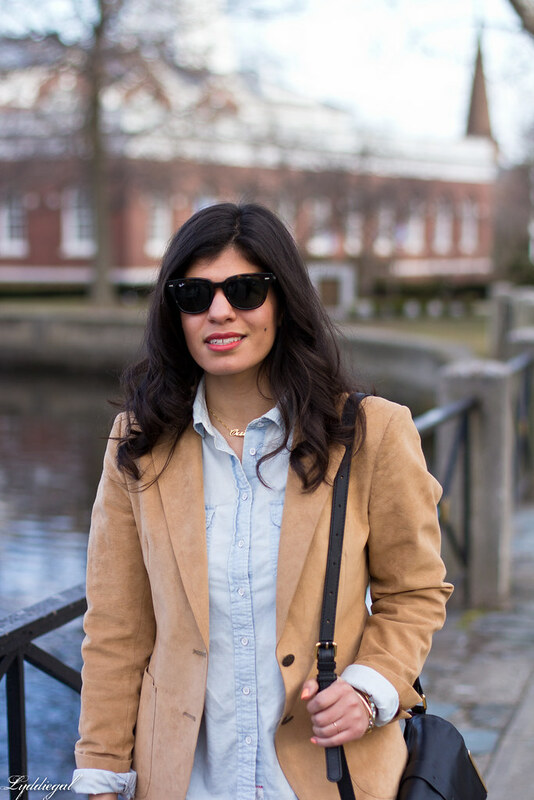 A camel blazer works so well with chambray.